Compact Wheel Loaders – An ideal size for many applications, make your “mini wheel loader” even more versatile by pairing it with Caterpillar’s broad range of work tools. High lift available on certain models to help you do even more with a compact machine. Small Wheel Loaders – Larger in size than the Compact Wheel Loaders, allowing more to be moved, and with increased technology, but also versatile and very fuel efficient. Medium Wheel Loaders – Highly customizable configurations. These wheel loaders provide you with the most reliable, productive and comfortable wheel loaders in the industry, built to tackle a wide range of jobs. Large Wheel Loaders – Powerful, responsive and rugged. Cat Large Wheel Loaders, including our largest, the Cat 994K, set the standard for high productivity and durability. No matter what your material or handling job is, your Cat dealer can help you choose the wheel loader that best matches your needs for reliability, component life, operator comfort and durability. 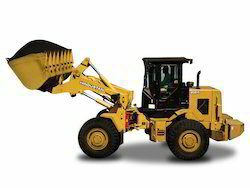 Hindustan 2021 Wheel Loader has been serving the Indian customers for over four decades and has earned the reputation of being the most reliable machine in the industry. It has been the market leader in the three-tonne category and has become a generic name for small wheel loaders. The new Cat 950 GC Wheel Loader is designed specifically to handle all the jobs on your worksite from material handling and truck loading, to general construction, to stockpiling. This machine is purpose-built to be just the right machine to get your everyday jobs done. Great machine performance combined with low owning and operating costs make the 950 GC the right choice for your business.